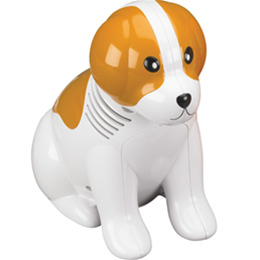 The Beagle Compressor Nebulizer is a lightweight compressor nebulizer that makes aerosol therapy for children easy and effective. This nebulizer comes complete with a disposable (18090-be & 18091-be) and reusable (18091-be) medicine cup neb kit, mouth piece, pediatric aerosol mask, tubing, two replacement filters and instructions. In addition the nebulizers come with a convenient Doggy House Backpack carry case and entertaining Doggy stickers inside the box, to keep the child entertained during treatment. With a particle size of .5 to 10 microns, you are ensured of a quick, effective therapy.